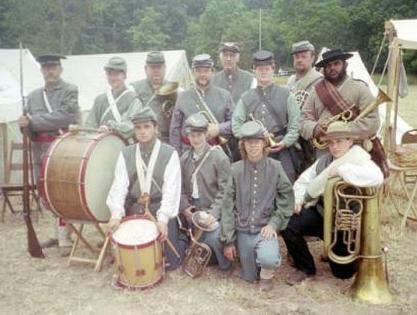 Our Reenactment Unit, known as the 46th Pennsylvania Regiment Band (The Logan Guard) was formed in December 1995 by a group of musicians from the Altooona Area of Central Pennsylvania. The band is now run by President, Lt. Rick Long and Principal Musician, Sgt. Maj. Bob Myers. It is our desire to honor the Logan Guards Militia from Lewistown, the 46th PA Regiment, and the musicians from the Birdsboro Community Band who enlisted as a group and maintained the morale of the troops with their music throughout the war. For more information on the role of regimental bands during the American Civil War, click here. Each of our members is both a talented musician and a gifted living historian who brings to life the typical soldier/musician of the American Civil War. The 46th takes the field with instruments, as well as under arms. We also reenact Confederate, as the band of the 17th Mississippi Volunteers. One of the most unique features of our unit is that the band performs entirely on original instruments from the mid- to late-19th Century (with the exception of the drums, as these were made from wood, which decomposes over time) to enhance the authenticity of our impression. The band performs concerts throughout the local community, as well as participating in living histories and battle reenactments across the Eastern United States. The band has produced four CDs entitled "The Logan Guard: In Camp and On Campaign with the 46th PA Infantry Band," "Honoring the Union & Confederacy: The Logan Guard," "Church Call," and "And the Ocean Waves Do Roll: Remembering the C.S.S. Hunley." The CDs contain numerous styles of music from the War Between the States, including marches, waltzes, polkas, schottishes, quicksteps, camp songs and more. These are performed not only on brass, but numbers on the harp and hammered dulcimer, played by the talented Sgt. Maj. Robert Myers, are also featured on our second CD. Our CDs are available for $15. For more information, to book a performance, or to order a CD, contact Band President, Rick Long.